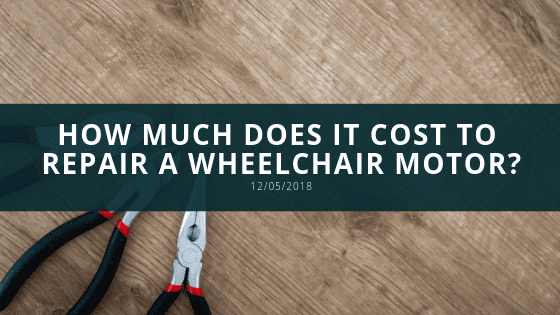 How Much Does it Cost to Repair a Wheelchair Motor? All electric wheelchairs are priced differently and the price increases for the higher quality wheelchairs that have more technology and higher resistant material. The motor is not meant to last forever and breakdowns can occur anytime if it's not maintained. The average cost is $125 for labor plus materials. Repairs can also be low cost but elevate significantly depending on the kind of damage. Some companies service the motors free of charge to the customer because their insurance covers it. However, it isn’t always covered. The cost can accumulate over time and can become a burden to some. It is extremely important to prevent these type of damages through occasional maintenance and avoiding too many impacts to the wheelchair. There are other parts that can be damaged if not taken care of and price of repair can amount to as much as a new motor repair cost and even exceed it. For a joystick control service price is an estimated $150 plus the purchase of broken parts. Some service is costly but not needed often if the wheelchair is taken care of constantly. Some minor services range from $60-$75 like armrest or inspections and cleaning. Warranties are a great thing to have for repairs done to the wheelchair to make sure if new parts fail it is covered without additional cost to the wheelchair user. These warranties may increase the cost of the repair, however, provides security that the parts will last long enough to be worth the price of labor and part. Some parts can last a long time but there are those that do not last long due to defects which is the main reason to rest assured that no additional money is spent to fix the issue. Other items that have to constantly checked are the wheels and parts like the armrest, seats, and leg rest. Wheels can be costly to repair depending on the comfort of the ride. Wheels have a high ranging price because the type of wheel chosen can be among three solid, flat free, and pneumatic. Each wheel serves a different purpose and is price differently which affect the quality of the wheelchair as a whole. The seats range from $60-$500 because the materials can be cheap and uncomfortable for long-term use and others can be durable, comfortable, and very high quality. If a wheelchair is taken care of throughout time the cost will be minimized because fewer repairs will be necessary. This entry was posted in Wheelchair. Bookmark the permalink. What Kind of Sports are Available for People in Wheelchairs?